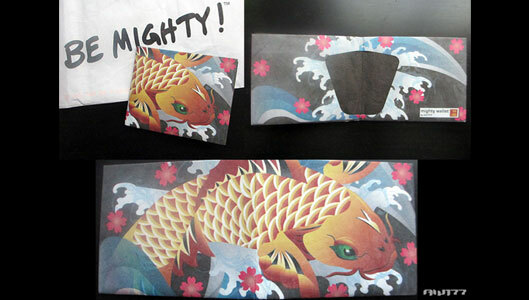 Received a special free gift from the fine folks over at Dynomighty/Mighty Wallet: a one-off print of my artist collective “Koi” wallet design! It didn’t make it into production since I didn’t get enough votes in time, but I really appreciate Dynomighty for making one for me anyway! It looks awesome and I can’t wait to use it! Thanks again! It appears I did not get enough backers to support official production of my “Koi” Mighty Wallet, which is a shame since I thought this design on a wallet would be awesome. Although disappointed, I do not give up and will create another Mighty Wallet sometime later in the future. I know the line is corny, but “if at first you don’t succeed…”. A HUGE THANK YOU goes out to those that did support my wallet – I really appreciate you taking the time to go and help try to get my wallet officially produced!!! 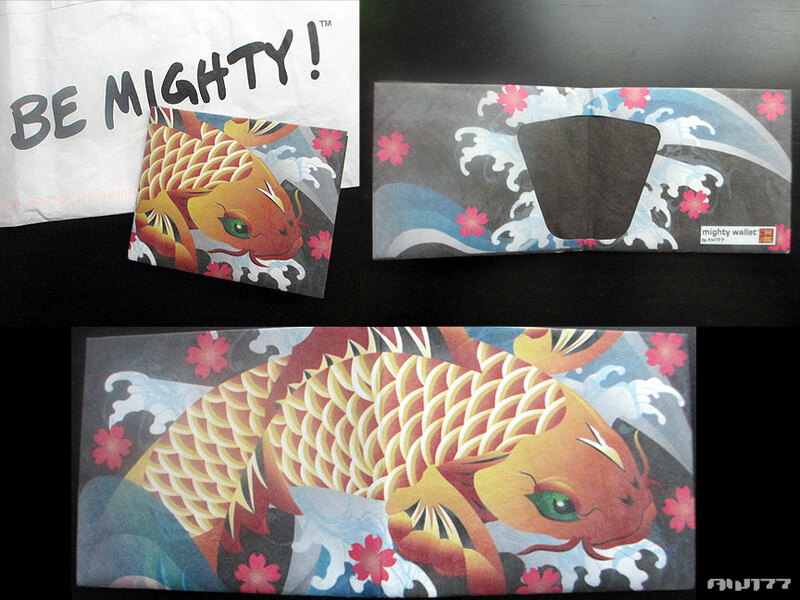 You can read what I originally wrote about my “Koi” Dynomighty’s Mighty Wallet below. Thanks again! A colorful Japanese koi fish jumping out of the water, surrounded by cherry blossoms. As you look at your Koi wallet, the fish represents perseverance in the face of adversity and the blossoms represent living life to the fullest. Opening the wallet reveals a powerful and red “koi” character, giving you good luck in everything you do and wherever you go. The inner pockets are lined red to give you prosperity and wealth. I hope my art will generate fortune, luck and powerful emotions in everyone! If you like what you see so far, and would love something like this as a wallet, I would appreciate it if you can back me and get this officially produced as a Mighty Wallet! It is only $15, quite durable, unique and just plain awesome! What site do you have?